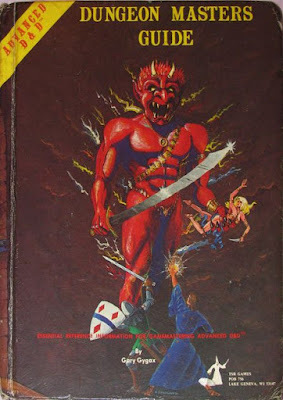 Well, I feel that the 1st ed DMG is an indispensable fountain of inspiration, and that no other gaming book has so much for a DM to learn from. Reminds me that I should re-read it again. If you only valued the books for minimum necessary information, then the Monster Manual was the least needed: DMG 1e Appendix E covers all Monster Stats, so the only thing needed from the MM 1e is the Treasure Type Appendix! Yeah, the DMG kind of sets the tone for the whole game. It's essential! I think you need the DMG magic items, at the very least! I can't imagine running 1e without the DMG; it seems the core of the game to me. I could have a B/X for monsters and pc classes, and use the 1e dmg for everything else, and it would still feel very 1e AD&D I think.